Most visitors to Islay arriving by boat and therefore having driven through Argyll will know Loch Fyne Whiskies in Inverarary. It is a nice stop on the way out to Islay. The owners are very friendly and helpful. And of interest to this blog they have recently started blogging as well on their Whisky News Blog. Having blogged about Kilchoman Distillery and Kilchoman 'New Spirit' here just a week ago it's worth noting that LFW now also offers it: LFW blogs about Kilchoman New Spirit. This is from the new distillery on Islay and has a peating level of 50ppm but as it is less than 3 years old it cannot be called whisky. Yet they're selling it, also keep in mind that it will soon be able to legally be called whisky. The first casks should be from late 2005 when they started distilling at Kilchoman. 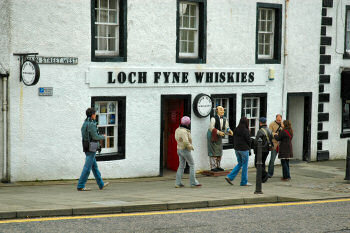 I'll be watching out for further posts about Islay whiskies at Loch Fyne Whiskies.